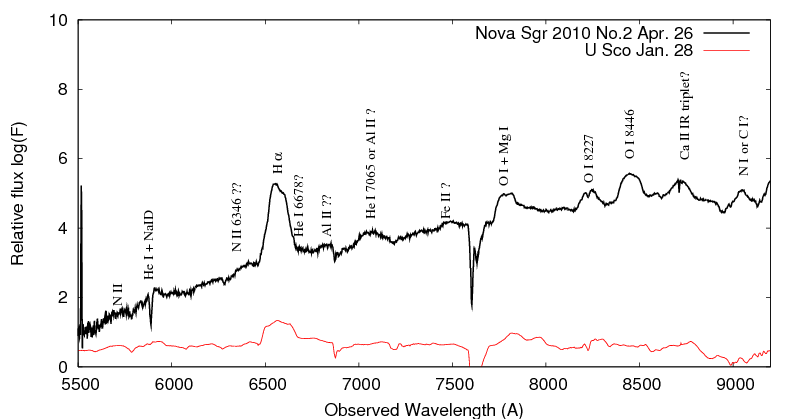 We update the spectra of Nova Sgr 2010 No.2. The H-alpha line profile shows the slight growth of the red component. 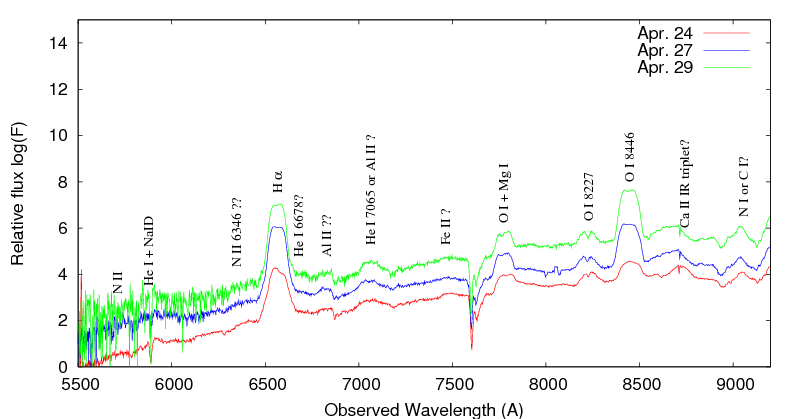 We update the spectra of V407 Cyg. We update the light curve of Type II SN 2009ls. 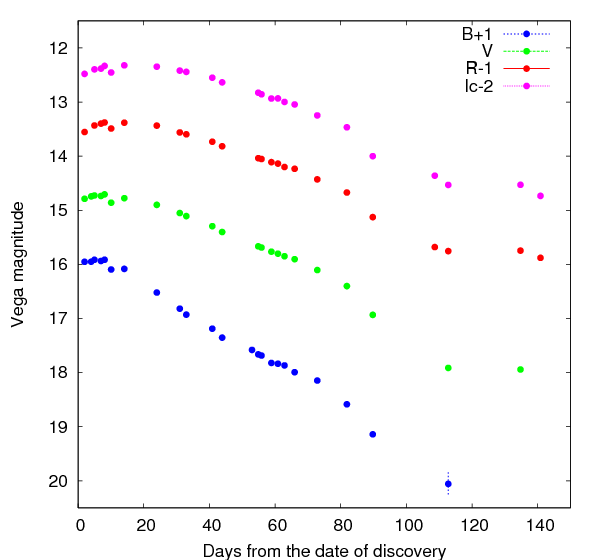 We update the light curve of U Sco. 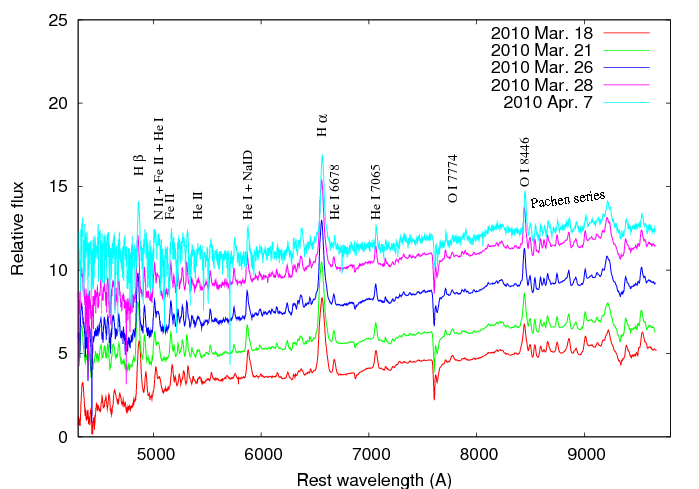 We update the spectra newly obtained using HOWPol. We confirmed a variability of the line profile in the H-alpha. The blue wing of the top of H-alpha is unseen that on Apr. 27. The features become the flat-topped profile. The other strong OI, HeI and CaII IR triplet features remained. ■ [Nova] Spectroscopy of Nova Sgr 2010 No.2 : very fast nova? 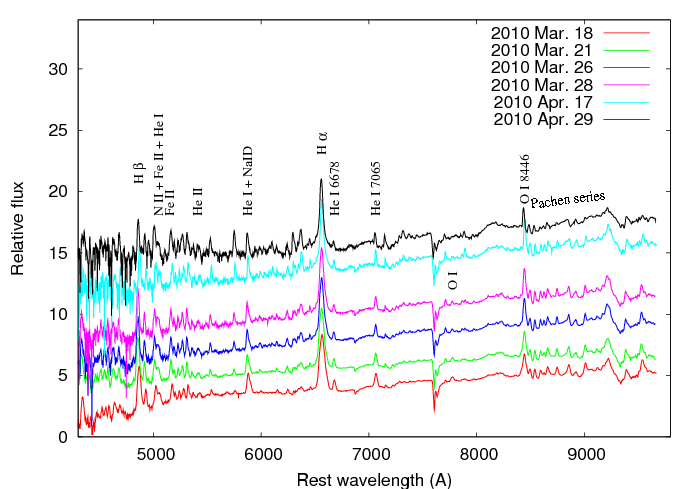 We performed the spectroscopic observations of Nova Sgr 2010 No.2 on Apr. 24. The spectrum shows a very broad emission line of Halpha. The FWHM of the line is measured of 9000km/s, comparable as that of a recurrent nova U Scorpii. Such high velocity suggests that this nova could be a very fast nova. The line profile exhibits the asymmetric shape in its peak, which has a blue substructure. The spectrum also exhibits the strong and broad lines of OI. There is an absorptions of the NaID due to the large extinctions from the interstellar dust. We will continue the Nova Sgr 2010 No.2. We update the data of S5 0716+714. The degree of polarization was still high. PG 1553+113? 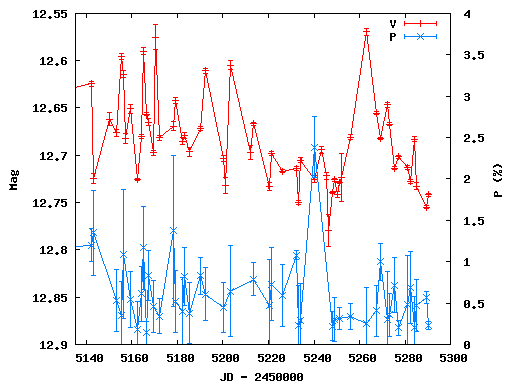 is classified as High-frequency peaked BL Lac object. The object has brightened since JD~2455214. The variability amplitude of magnitude was about 0.6 mag for 100 days. We update the data of 3C 454.3. The object became faint, about V~15.3. Althogh, the object had been bright state since our monitoring season in 2009, the object has recently entered the rapidly fading. The object was about V=15.2, and the amplitude of this fading was more than 0.4 mag. We continue to observe this object. 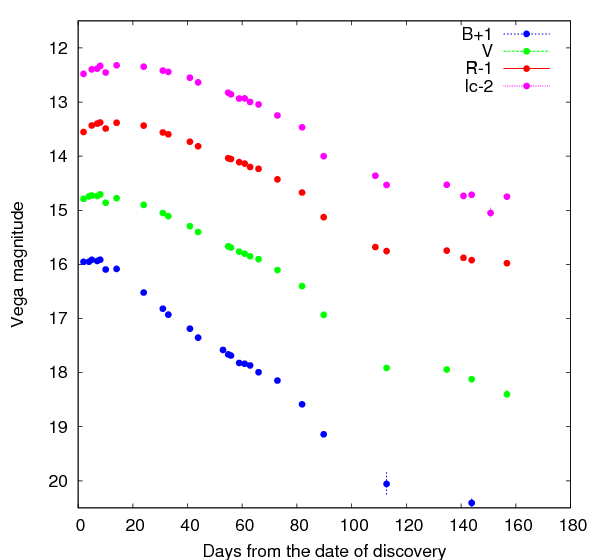 We update the light curve of recurrent nova U Sco. 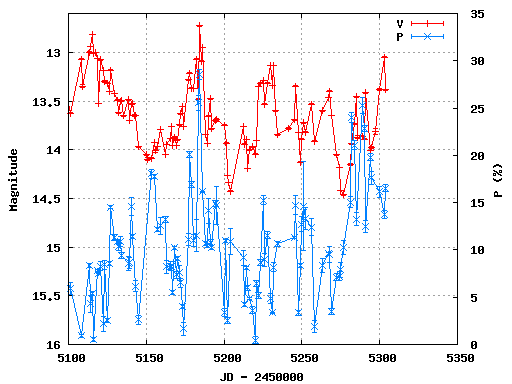 We update the light curve of Type IIP SN 2010bj. The B-band light curve shows rapidly fading. 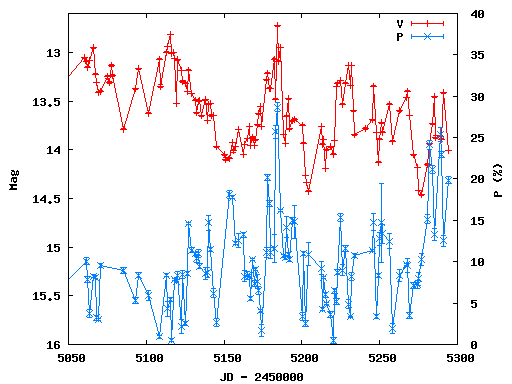 It is corresponding to that seen in a light curve of a typical SNe IIP. We update the spectra of the classical nova V1280 Sco. 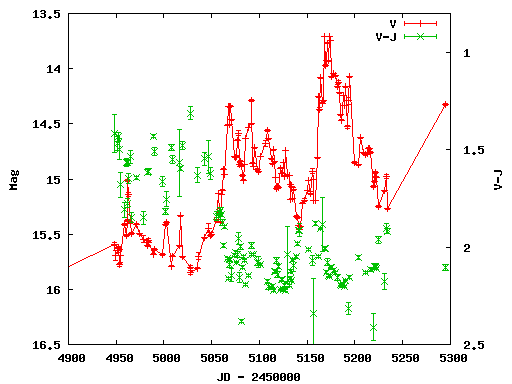 We update the light curve of Type IIP SN 2010bj. We update the light curve of Type IIP SN 2009ls. 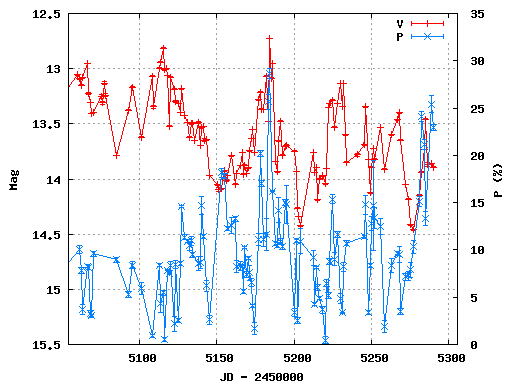 We update the spectra of symbiotic nova V407 Cyg. 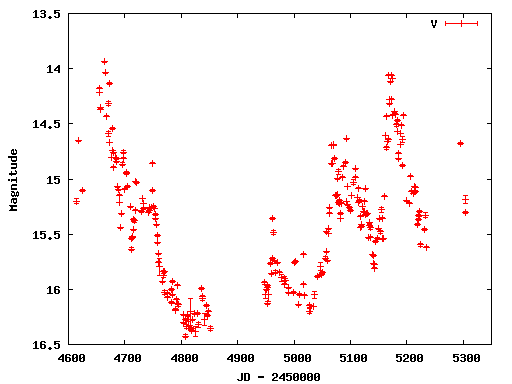 We update the light curve of Type II SN 2010bj. We update the data of S5 0716+714. The figure shows the light curve of the object and temporal variation of the polarization degree in the V band. The polarization degree keeps to be high, larger than 10 %. Fermi/LAT detected an increasing gamma-ray activity from the 3C 454.3 (ATel #2534). After this report, we have started to observe the object in 2010 season. 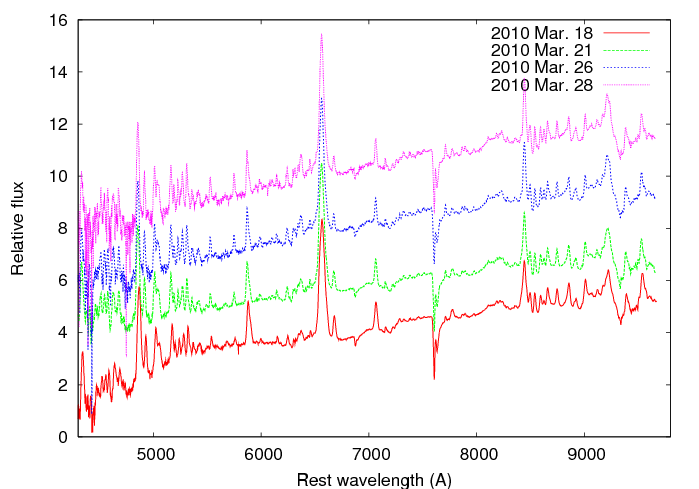 The figure shows the light curve in the V band and the V-J color variation. We detected the increasing optical activity from the object. The flux in the optical band has been increased coincident with that of the gamma-ray band. The V-J color showed about the same value at the flare in 2009 season, and about 2.1. We have performed the photometric observations of Type II SN 2009ls. 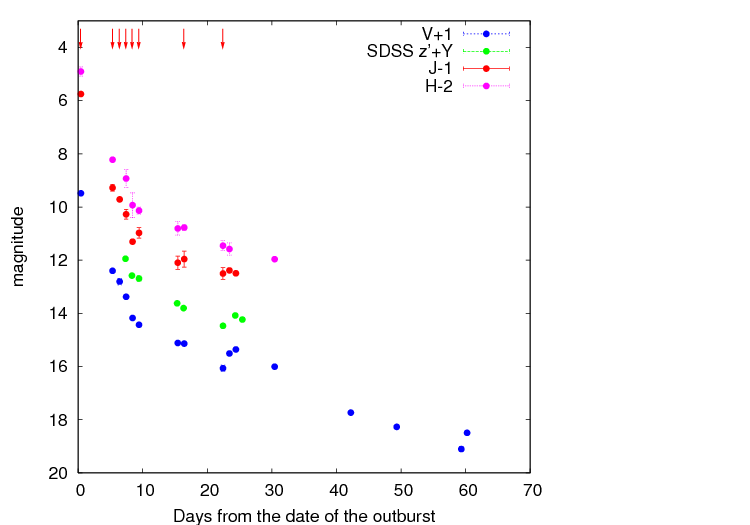 The light curves indicate that SN 2009ls would reached the "secondary plateau phase". For a typical SN, the luminosity should linearly decrease according to the decay of the Co56. This conspicuous behavior was seen in another Type IIP SN 2004dj (Tsvetkov et al. 2008). These results indicate that the diffusion of the hydrogen have roughly finished in its expanding atmosphere, but the layered material may be left in the inner part. If we confirm how long the "secondary plateau" continue, we may estimate the mass and the abundance of the hydrogen (or layered Helium?). 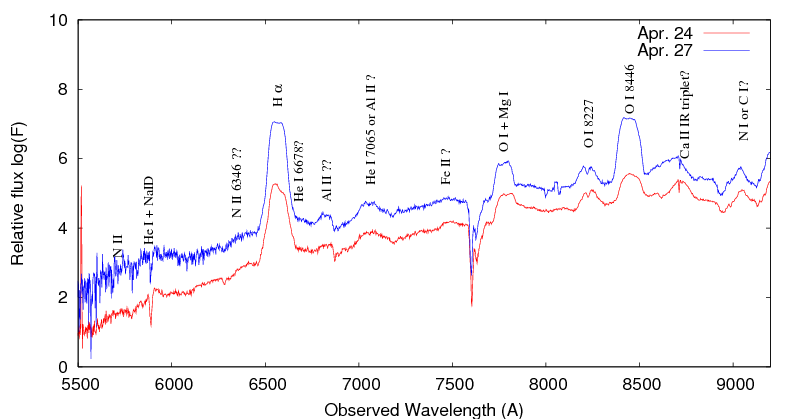 The spectra would show the nebular emission lines with weak (or no) hydrogen lines. We will continue the photometry. 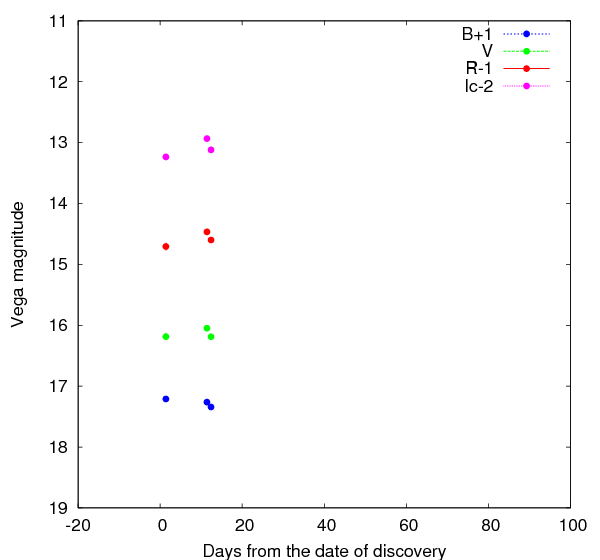 We have performed the spectroscopic observations for the symbiotic nova V407 Cyg. Its spectra show several peculiar characteristics as a classical nova. 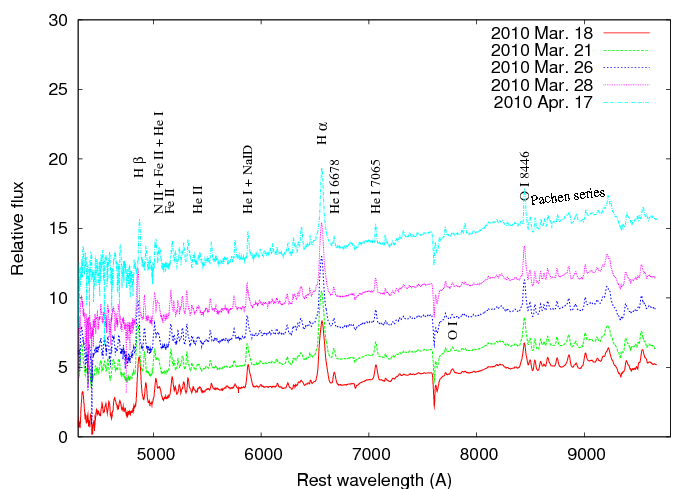 First, the spectra show the both emission lines of FeII and HeI. In general, classical nova is classified into the FeII or He/N class. Our spectra exhibit the both characteristics. Thus, V407 Cyg may be classified into the 'Hybrid nova' like V458 Vul. 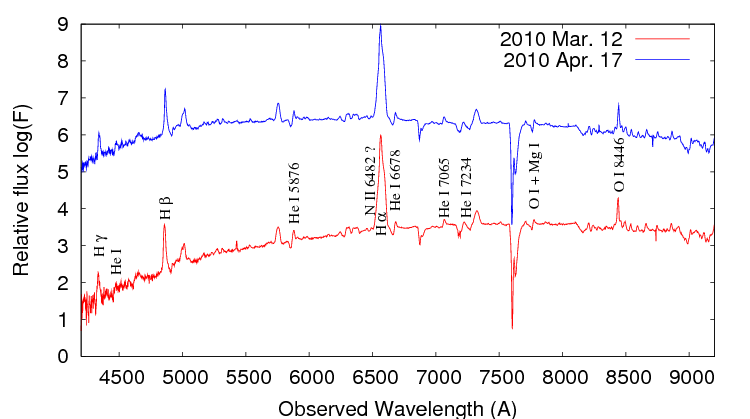 The HeII is also possibly seen in our spectra. In general, such a highly excited emission line is come to be seen in its later nebular phase. However, The evolutions of the spectral profile (and the light curve) are rather slow for a symbiotic nova (e.g., RS Oph; Iijima 2009). The behavior contradicts the appearance of the highly excited emission lines. Alternatively, the width of the Balmer series is broadened as > 5000 km/s, but the other lines clearly show the rather narrower than those of Balmer siries. These spectroscopic features are remarkably conspicuous for the classical nova. Although the nova eruption is rarely confirmed in a symbiotic system, a few outbursts of this subclass occur as a recurrent nova (e.g., T CrB and RS Oph). As the photosphere of expanding shell is shrinkage, the inner part ejecta unveiled and the nebular emission lines should reveal. We will continue the spectroscopy for V407 Cyg. 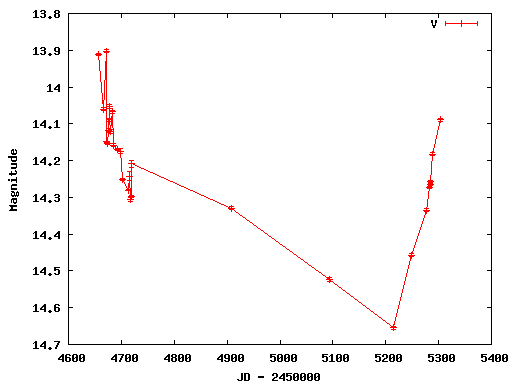 We have performed the photometric observations of Type II SN 2010bj since Mar. 28 (UT). SN 2010bj was discovered of 15.3 mag at 27.05 Mar. in spiral galaxy NGC 2357 by L. Cox (reported in CBET 2230). The distance modulus to this host galaxy is adopted as 32.5 referred in NED/extragalactic database. This SN was classified as a Type II SN around its maximum phase from the spectroscopy at Apr. 6 by Challis et al. (reported in CBET 2232). 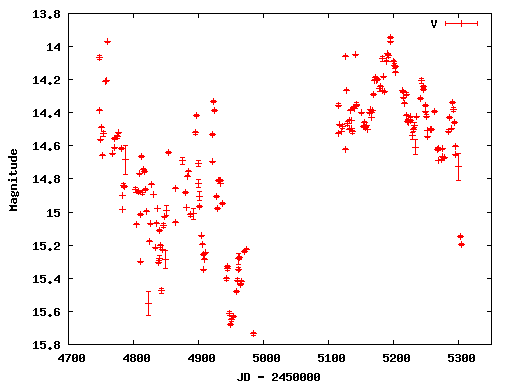 Our obtained light curve also indicate that SN 2010bj is well similar to that of a typical Type II SN. We will continue the observations of this object until the limited date. We have observed 3C 273 in photo and polarimetri mode using TRISPEC since 11, Dec. 2008. We show the data from 21, Oct. 2009. It is reported that the object has Big Blue Bump (BBB) in UV region in SED. BBB is thought to be a thermal emission and radiate from the accretion disk. We can consider that the thermal emission is unpolarized. The polarization degree of the object, thus, is low compared with other blazars. We also consider that the thermal emission should not vary rapidly. 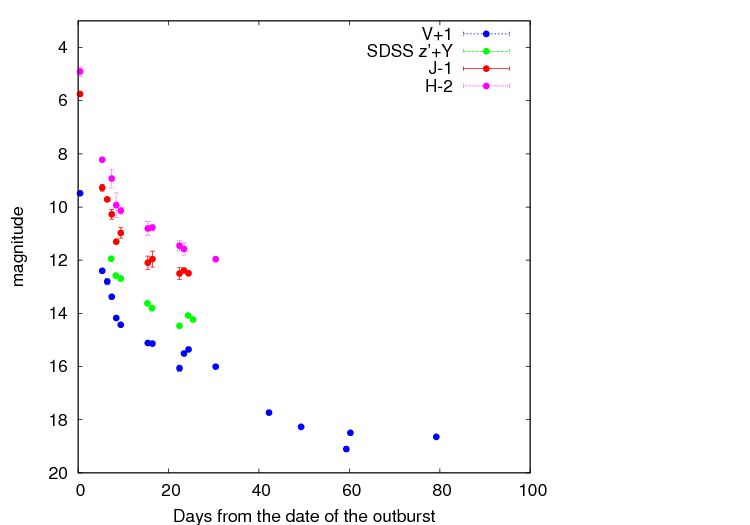 The light curve of the object has been less variable, delta(V) < 0.2. We update the data of S5 0716+714. The polarization degree of the object has still been high. "KANATA" is a 1.5-m telescope at Higashi-Hiroshima Observatory (Hiroshima University, Japan), which was developed for observations of astronomical transients and variable stars. Data policy: Please contact Dr. Makoto Uemura (uemuram_at_hiroshima-u.ac.jp) if you want to use the data shown in the blog for your research. [LBV] Optical Transient in UGC 5460 : still rising !